Ai Picture Utility (AiPICT) views, edits, enhances, manages and organizes photos -- plays multimedia too. It is designed for speed and simplicity; novices will avoid learning curves while professionals will appreciate powerful batch image processing and conversion capabilities. Included Batch UnZipper extracts multiple ZIPs unattended + batch rename, move and delete. 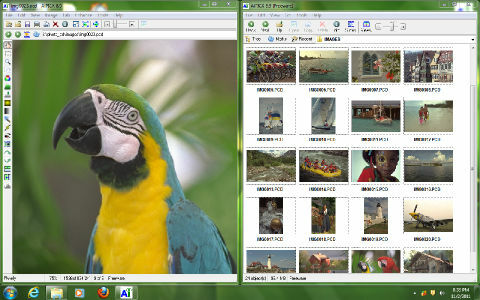 Its Slide Album can quickly find and thumbnail entire drives (or offline volumes on CD or DVD) and organize images by visual content to find modified duplicates -- aside from database queries by date, size, keyword ... Our proprietary Image Analysis routines can quantify and rank picture quality. Create impressive slideshows (or presentations) with 173 cool effects, variable delays, windows-in-windows, gamma, background, rotation, comments and other properties (per slide). Our speedy viewer is unmatched; includes gamma, widescreen, zooming, fit-to-window options. JPEG Wizard creates tiny, high-quality files. Aside from standard cut and paste functions, its grid and viewport makes collage creation effortless. Image tools include EXIF camera + JPEG comments; red eye removal; TWAIN cameras, scanners; instant wallpaper; variably-sized prints; smooth resizing; rotate-by-degree; screen capture; descreening; borders, image text (with variables), automatic color correction, unique smoothing and sharpening functions -- all of which can combine in vast sequences to fix (e.g., backlighting, over-exposure, under-exposure) or enhance any image (e.g., glamour photography). Advanced filters include variable equalization + normalization, unsharp mask, histogram, masked bitmap operations, remapping, contrast enhancement and restoration, ... Formats supported: PNG, PhotoCD, Photoshop, BMP, PCX, TGA, WMF, DCX, Multi-page TIF (w/ anti-aliasing for easy reading), MP3, WAV, AVI, MPEG, MIDI, CD audio, WMV, WMA, ASF, ... more ! This is a system for Multilanguage applications development in Visual Basic 6. Language Suite lets you easily organize Multilanguage settings of your application within its own database. Even a non-advanced user can fulfill localization tables of your application using the Designer function. You can easily organize a team-work of developers and linguists within your company network. The developer just needs to insert program objects names and their native language description into a database and the translator needs to fill in the other languages columns. They can do this simultaneously and on completing the project as well. No additional recompiling is necessary. Our objective is to provide the most ultimate management and localization database settings retrieval convenience possible, instead of an automatic localization. Even a beginner can write a function retrieving the localization settings. This function can be the only in the whole application and designed for a definite form as well. It depends on the peculiarities and the optimum solution for a definite application. Four forms have been included: Logon, About, History and Tip of the Day. Each of them can be easily modified according to your requirements and recalled just by one code string. Aves Bird Watcher Log is a complete computerised solution for the large community of bird watchers around the globe. It is suitable for beginners and gurus. Includes world bird list, image collection, trip log, daily diary, club members list and more. Very simple and efficient user interface for keeping track of daily sightings, trips, weather conditions, habitats, bird watcher's club member details and other information all in one package. Aves Bird Watcher Log can handle all popular image formats and will allow you to link unlimited number of photos to your sighting and trip records. Our program takes care of the data presentation, export and analysis. Impress your friends with cool documents you created using our software. You can create your own web pages in a matter of seconds. Once the data is entered, you can use the graph module to answer any question you might have about your past sightings such as: How many species have been observed each month last year OR What species appeared more frequently in the morning and in the evening OR How much data have been entered since I started using the log (sightings, trips, journal entries etc). 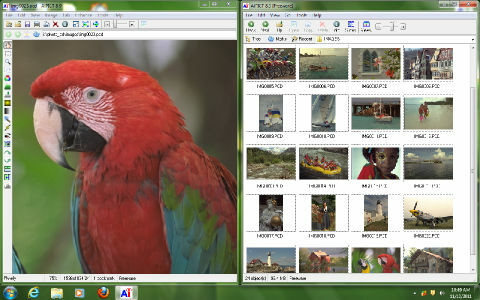 Aves Bird Watcher Log supports all major printer types and prints our bird details and images in colour. It is ideal for installing on a laptop and will run nicely with minimum hardware requirements. You can take it to your next trip. Can package and install not only programs but also all kind of files. Includes install and uninstall support for Windows 9.x/NT/ME/2000/XP. Compress all files in a single executable. Setup overhead is less than 100 KB. What you see is what you get, easy visual configuration. Projects in English, Spanish, French, Portuguese, Italian, Galician, Hungarian and Dutch languages are included.